Asteraceae (daisy family), subfamily Asteroidae. The plant has a pleasant anise-like scent (see also licorice), copying almost perfectly the fragrance of tarragon. The leaves’ taste is similar and very intense. Mexican marigold grows in the South of the USA and in México. The botanical genus name Tagetes is in reference to a Roman deity, Tages (which, probably, was originally an Etruscan god of prophecy, but was later adopted as a son or grandson of Jupiter by the Romans). The species name lucidus bright (cf. lux light ) refers to the bright orange flowers. 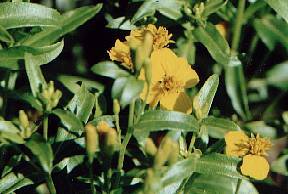 In English marigold Mary’s gold , the second element is probably also motivated by the orange flowers displayed by all members of the genus. I do not know, however, why several Tagetes species are associated with Mary, a significant figure in Latin American Catholic mythology. See tarragon for the derivation of the name tarragon. Mexican mari­gold has been in use since Aztec times, both for religious and medical purposes. Today, it is a popular herb in the Southern states of the USA, since it can substitute the well-known tarragon very well, but can be grown more easily in a hot climate. Closely similar to tarragon, Mexican marigold is stronger and more robust; therefore, it goes better with spicy food as is loved in the Southwest of the United States. Mexican marigold is good for bouquet garni (see parsley), for flavoured butter and herbed vinegar (see dill). Its pleasant scent harmonizes very well with poultry. Quite amazingly, I have not come over Mexican recipes using this herb. 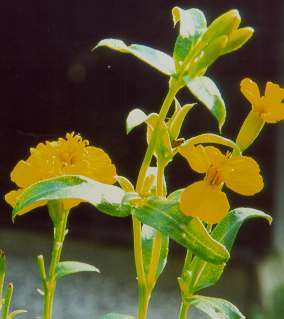 There is, however, a related species Tagetes micrantha known as licorice marigold with similar flavour which is sometimes mentioned in Mexican cookbooks. Moreover, Mexican marigold makes quite an acceptable substitute for the Mexican pepper-leaf in recipes where the pepperleaves are ground to a paste or puree, like mole verde. Since the Mexican tarragon is much sweeter, you will have to adjust dosage accordingly.